The above info came from Sarai Keegan, and was edited by yours truly (contact me). Spin is the fastest bot in Flip City. He gets pulled into the Kei'zatsu tribe by Captain Pounder even though he isn't even a Kei'zatsu. There he beats up criminal bots like Manx, Macro, and Botch.Spin is always trying to prove to Captain Pounder that Vertex is some sort of spiderbot, but Pounder brushes it off. He doesn't like the idea of Spin blabbing that kind of stuff to all the other Kei'zatsu. Apparently it's against the rules. Anyway, Spin keeps trying to convince Pounder that Vertex is a spider, until in one of the last episodes he gets kicked off the force. He then is declared a criminal bot for chasing bad guys without a badge, speeding, and so on. He gets sent to jail but soon breaks out by tricking Lance into opening the door to his jail cell. 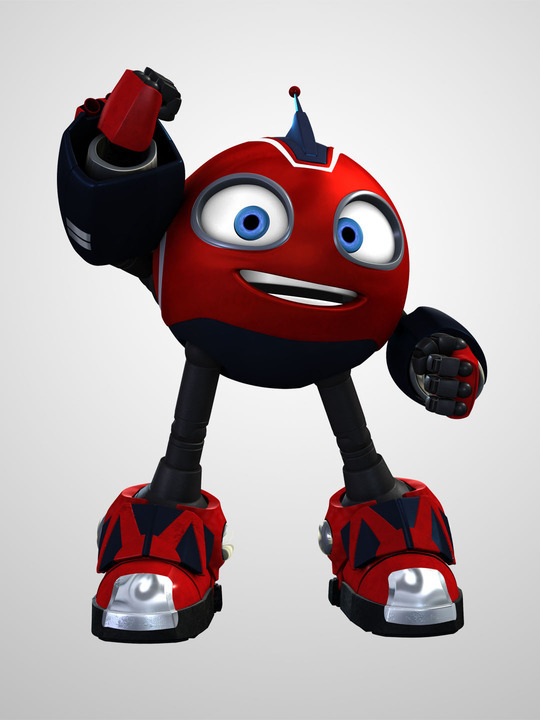 In the final episode he goes to Vertex's lair for the final showdown,but Captain Pounder stops him.He reveals that Spin is the last member of the Zushin tribe,which Vertex destroyed to extinction.Vertex tries to destroy the safety net and take control over the Hub,eventually destroying the RollBots. Captain Pounder tells Spin to use his Zushin powers to reset the Hub and fix the safety net. As Spin does exactly that Pounder and Vertex start fighting again and they fall over the edge. The safety net is still repairing itself so there is a hole. And... well... Pounder and Vertex fall through the hole to the far-down surface and are destroyed. At the FCPD, since Pounder is dead, Penny gets the title of Kei'zatsu leader. The above description came from Sarai Keegan, and was edited by yours truly (contact me).